This post has been a long time coming, I swear. About.... a month ago I visited The Body Shop after a Sunday morning shift (when I still worked, of course). I remember this day clearly because there was a Ukranian festival going on and the entire street was blocked off for like... 6 blocks or more. I wanted to go read in a cafe after work so I had to fight through the crowd. I ended up reading for only 45 minutes because there was a crying baby behind me in the cafe and a loud band right outside so I just chose the worst day possible. As I fought my way back through the crowd, I stopped into TBS and had to use an immense amount of willpower not to buy everything. I was lucky that day because I managed to get a few items for really great prices. 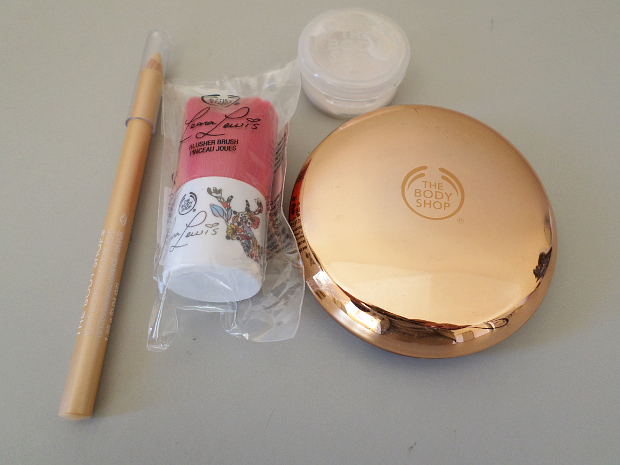 The little container is their BB Cream in the newest pale colour 00. I had tried 01 and it was way too dark for me, so I was definitely excited to try their new colour. I can honestly say I like the Vitamin E BB cream so much more. The one cool thing about this new one is that it changes colour when rubbed into your skin (I'm not that pale). This one is very oily and the colour is still a tiny touch too tan for me, so it'd be good for my someone with dry skin that just came from vacation. The other 3 items were bought in a bundle. They were all in the sale section and they were having some deal that you need to buy 3 items and you'll get one price for them. They were $3 each of something along the lines, an amazing deal for products that range from $8-$18. I bought the little flower brush for my makeup bag. 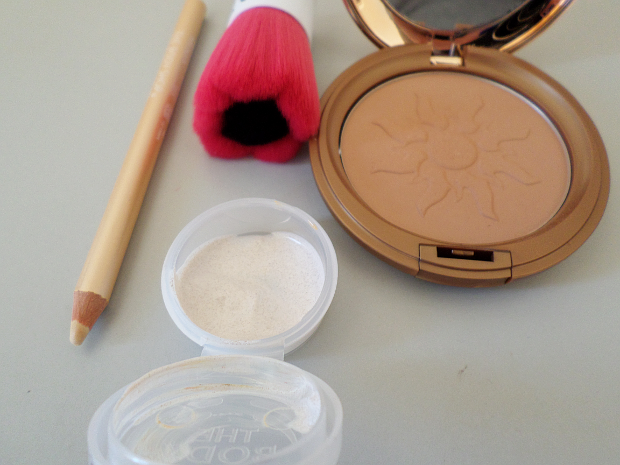 I use this Physician's Formula pressed powder and it comes with one of those half-moon brushes (you know... the ones that come in all the Benefit blushes) and it really packs on the powder when I really want a soft look, so I decided to buy a separate brush instead. Also, some good news: I have an interview at The Body Shop Sunday morning for a part-time seasonal position! Because we're moving I just need something temporary for the next two months so I can still make some money. Hello ladies, long time no-see!! I'm so sorry for my long absence, it's been quite a while since I last updated. My life has been turned upside down the past month, and if you know me, you know I'm not a huge fan of change. At the end of September I was laid off from the restaurant (I worked as a Hostess for nearly 2 years) because the landlord has decided to redevelop the block and make an indoor shopping center for the new condos coming up. So basically the entire team had to scramble to find new work. I had gotten my brother a job there as a Server Assistant about 2 months before and he was working hard to become a Server so it was a bit of a hard blow for him, but he's found a job as a Server now. It's a funny situation with me because I was planning on quitting, so it made the transition easy for me. During the month of September I had 2 workplaces that were interested in hiring me as a Barista (I missed being one) and so I was doing interviews (I was just getting over my cold at the time), and they both went really well. So my first choice cafe took a while to call me back so I was going to call back as a follow up from the interview but then my second choice emailed me saying they wanted to offer me a position and they asked when I can come in to start, so I gave it some thought and accepted and asked them to start a few days later on a Friday so I could be healthier. A few days go by and nothing. I email them back the Thursday asking if Friday is ok to start and what's the uniform etcetc. Nothing. I call them Thursday night and this girl answers and tells me all the managers have gone home for the night but she'll pass my name and number on to one first thing in the morning. 12:00pm Friday and no response. I call back the place and the same girl answers telling me she gave my information to the manager 2 hours ago. I never got a call back or an email. So basically I have no job and no income, which you'd think would give me plenty of time to blog, right? But then my parents put the house up on the market (which we were always planning on selling it but after 2 failed attempts and a signed contract from one agent that basically said we couldn't list the house for 6 months after being released from the contract). So those 6 months had already passed and we took the original agent we always had a good feeling about and for one week we had showings all day so basically we'd be up at 9:00am, out of the house by 10 and come back at 6:00pm. We would go to the dog park, have some lunch at a picnic table and then sit in the car for 3 hours waiting. It was horrible and I was exhausted. But, we got an offer and sold the house for 98% asking price! Our last day is December 20th (Boooooo I didn't want to move around Christmas!!) and now we're hunting for a farm about 2 hours outside of Toronto. I need to get my Driver's License because I'll need to drive around in the country, but I'm so scared of driving so it'll take some willpower. So basically my life has been super different and it'll be hard to adjust from city to country, but I'm sure it'll happen. I need some peace and quiet for a bit and some nature to nurture the soul. Oh, also! I'm writing a book! I've always wanted to write a book but I was always went with novels and I started writing about 4-5 different novels that all failed. About a year ago I found that Joseph Gordon-Levitt and wirrow created The Tiny Book of Tiny Stories on hitRECord.org. I fell in love with the book and joined the site and was astonished to find so much inspiration coming to me and I wrote around 70 tiny stories to be submitted as part of the book. None of them got chosen and to be completely honest, I was pretty disappointed and if I didn't doubt my work then, I definitely did now. But then I realized that my writing is so much better when I get these little bursts of inspiration rather than forcing a huge novel. So I'm writing a book of short stories, ranging from 1-2 sentences to maybe 2 paragraphs. It's coming along well and I'm so excited! I've also been spending a lot of time looking through websites such as Pier 1, Pottery Barn, Urban Barn etc for home inspirations! My parents are moving to this farm and that's it, they're not going to move again so they asked me to decorate it for them and of course I said yes! I absolutely love design and decor, so this is a treat for me (and a bit of a challenge). Of course, the stores I listed are supersuper expensive and can quickly clear a bank account, so I'm also going to be raiding some thrift shops. My mom and I have found some really great expensive pieces for so cheap. Our style is very rustic, warm and cozy (go on my Tumblr and you'll see what I mean), so I want this house to just be like a giant furnace, I want everyone to feel at home the second they walk through the door. Keep your eyes open for my home posts because they will come! I have a lot of furniture to buy. I think I've babbled long enough so that's it for now. Keep your eyes open for some beauty posts because they will come.